The city is targeting road safety at 14 schools this summer. Four of them will get comprehensive safety studies. The school flashers at International School of Louisiana’s middle school on Orleans Avenue are working again. They were turned off after another charter school had vacated the building. ISL moved in soon after. 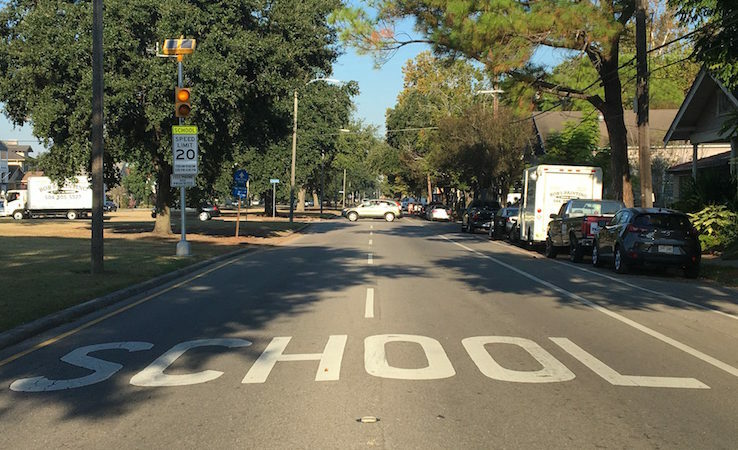 The city of New Orleans has turned on school-zone flashers and re-installed signs at two schools after The Lens pointed out that children were still using the buildings. City workers had turned off the flashers and removed the signs at the John Dibert building on Orleans Avenue and the Ronald McNair building on Carrollton Avenue after they were vacated by charter schools. But two other charter schools moved in. Both serve children in seventh grade and under. That’s the threshold for installing flashers, which warn drivers to slow down to 20 mph for two hours every morning and afternoon when school is in session. The Lens noticed the problem in September when we surveyed all the school-zone lights in the city. It was our fourth survey in two years. The first time we checked, just 40 percent of lights worked properly. That creeped up to 52 percent last fall. This fall, we found a marked improvement: Nearly 80 percent worked. When we checked on Nov. 4, the lights in front of International School of Louisiana’s middle school flashed, but there were no signs warning drivers to slow down. Now the signs are back, too. But we noticed there were no lights or signs in front of International School of Louisiana’s campus on Orleans Avenue, which houses its middle school. Nor at ReNEW Schools’ McNair campus on Carrollton Avenue. A ReNEW spokesman said it serves students from pre-K through eighth grade. When we told a city spokesman, he responded that city didn’t know the building on Carrollton was in use. The city also thought the school on Orleans Avenue was a high school; they have school zones, but no lights. That doesn’t explain why the signs were removed, however. A city spokesman said the city checks with the Orleans Parish School Board each year to see where schools are located. But that board oversees just a third of the schools in the city. Neither ReNEW nor International School of Louisiana fall under its authority. A couple of weeks ago, we saw that the lights at the two schools were on, but there weren’t signs. Now the signs are back, too. In mid-October, the Landrieu administration announced that it would install more traffic cameras around the city. Many of them will be located in school zones. There is a speeding-ticket camera located in front of ReNEW’s building on Carrollton, but not International School of Louisiana on Orleans.